(Seaside, OR, USA) - On February 23 – 25, Seaside turns on the heat with the 24th Annual “Oregon Dixieland Jubilee,” filled with 11 bands and five venues buzzing with the bubbly sounds of old time jazz over three days. Presented by Seaside’s Lighthouse Jazz Society, the Oregon Dixieland Jubilee features bands from California, Canada, Missouri, Portland, Connecticut and Washington. The list of bands includes Blue Street Jazz Band, 51st Eight, Titan Hot Seven, Bob Schulz Frisco Jazz Band, High Sierra Jazz Band, Uptown Lowdown Jazz Band, Cornet Chop Suey, Parlor Jam featuring Brady McKay, Jim Beatty Jazz Band with Pat O'Neal and Jay Fleming, Ivory & Gold, No Inhibitions Jazz Band, Claire McKenna and the Seaside HS Jazz Band. There are special appearances by Brady McKay and Claire McKenna, and the “afterglow” program at the Best Western Oceanview features a special Italian buffet after the closing ceremonies. Biographies, pictures and music samples of the bands can be found here at this website. The five venues this year are Convention Center Main Hall, Convention Center Exhibit Hall, Convention Center Riverview Room, Best Western Oceanview Resort, and the newly added Seaside Elks Club. A shuttle will run between the venues. The opening ceremony happens Friday, February 23, 4 p.m. at the Convention Center, featuring 51st Eight, Seaside HS, Blue St., Parlor Jam & Claire McKenna. 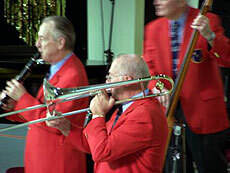 The closing ceremony takes place at the main hall of the convention center, featuring Uptown, Jim Beatty, Frisco and Cornet Chop Suey. There is a free gospel show at the main hall on Sunday morning at 9:30 a.m., featuring Blue Steer. The Afterglow program features live music by Titan Hot 7 at the Best Western Oceanview. Cost for that show is $25. Cost for the festival is $65 for the three-day badge. Friday’s cost is $25. Saturday all-day pass is $40. Saturday night only is $25. Sunday’s all-day pass is $20. http://www.jazzseaside.com. 800-394-3303.